Look up! Look up! 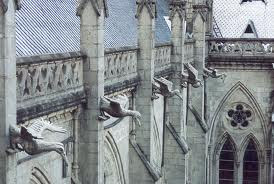 A multitude of gargoyles haunt the medieval buildings of Western Europe, peering down from churches, cathedrals, houses and town halls. Clinging to edges and ledges, these projections carved from stone take the form of human or animals or fantastic beasts. Gargoyle statues are a very common symbol in home and garden decor today but do you know what the gargoyle is symbolising when you use it in your design? Gargoyles were commonly used in medieval times. Their two main purposes were to scare off evil, and to divert rainwater. Many had open mouths and long necks because they functioned as downspouts to divert rainwater from building foundations. 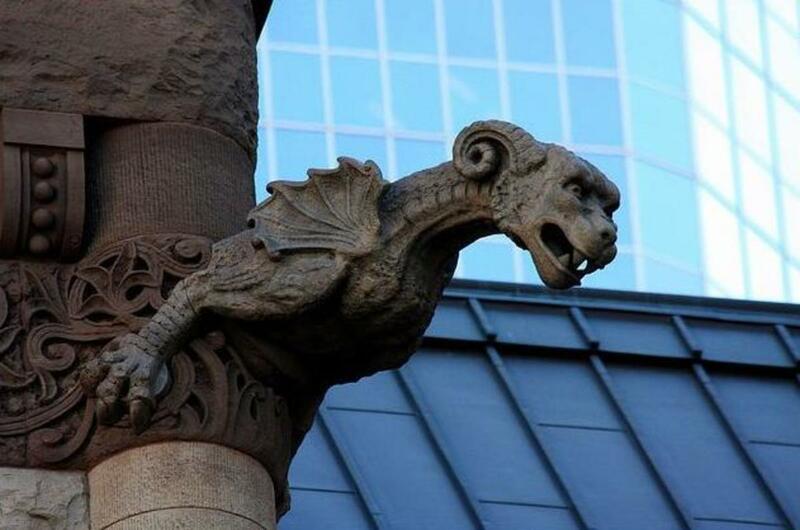 The word "Gargoyle" originates from the old French word "Gargouille" meaning "throat" but which also describes the gurgling sound of water as it is coming down the downspout. To understand medieval sculpture you must imagine the medieval person's powerful belief in God. The cathedral was the manifestation of their faith. The cathedral was to be the most beautiful structure on earth, and no task was considered too arduous for the glory of God. It is believed the Catholic Church originally used gargoyle statues as a visual reminder to their Pagan converts, many of whom were illiterate. They were something of a "sermon in stone", or a warning of sorts to teach the people how to behave in a non-written way. The frightening nature of gargoyles was partly due to the medieval artist's responsibility to mould public behaviour through intimidating images.The purpose was to frighten and to startle man amid his everyday life. These fantastic beasts were destined to be a clear and constant reminder that the devil and original sin exist. Alongside the beauty and splendor of the magnificent cathedral, the serpent lurks. Not gargoyles were for religious instruction. Some were simply grotesque. One reason for this is the belief that frightening figures could scare away evil spirits, and they were put on the outsides of buildings to do just that. Other gargoyles appear more comical with lively expressions, laughing faces and animated poses. It seems unlikely that these entertaining figures were meant to represent the devil but in medieval times the devil could be droll as well as terrifying. The devil in medieval folklore could be made repulsive in a funny way, becoming less frightening and more of a buffoon. 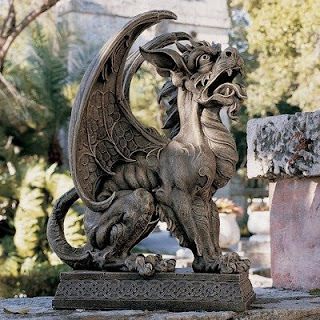 When you incorporate gargoyle statues into your garden design, what matters most is that the ornament means something to you. It might quicken your heart, create a sense of mystery, make you remember, think or feel, dream of another time or place or elicit your laughter. As long as it gives you a sense of pleasure, gargoyle garden statues can add a unique focal point or element of surprise to your home garden. you are providing great and quality services, i appreciate you. Thanks for sharing as it is an excellent post on outdoor religious statuary and would love to read your future post. i used to watch the Gargoyles Cartoon series then Sega Genesis released the Gargoyles video game.. I had seen these grotesque on European architecture before but did not know that this Idea actually taken from these grotesque..
somehow i thought it belongs to gothic culture... Well! i like the information that was so interesting.. Thanks a lot for sharing. Thank's a lot for sharing now I know what does it meant. Thanks lots for this enlightenment!